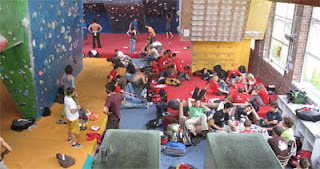 Since we last blogged a fair bit has been happening at The Climbing Works. This has actually been the reason behind the lack of blogs as we've been so busy chasing our own tails we've had little chance to tell all our lovely members what's been going on. The biggest time-eater has been the new reception area. We ripped out the old one and replaced it with a new, bigger, all-singing all-dancing reception. The people who will notice the changes the most will be us, the staff, as it gives us more room and will make a big difference when Autumn and Winter roll around. As with any change, there's always disruption. What was supposed to take a few days ended up taking over a week. Add to that our phone and internet going down, the card machine breaking and Percy changing the office and holds room, it's been a bit of a mad week. All is finished now so we can get back to what we do best - setting high quality boulder problems. First up is the Green's which will come down this week with a new circuit up by early next week. The last few weeks also saw Sheffield host a round of the IFSC Bouldering World Cup. An amazing event which produced a fantastic competition. There's a highlights video on our last blog. The Works was isolation for the event and as you can see below, there were alot of competitors using the facility to warm-up, rest or if you're Adam Ondra - read Jerry Moffat's book. Other little changes in the Works in July has been the re-painting of the wall opposite reception. A bit of fresh colour for the Summer.